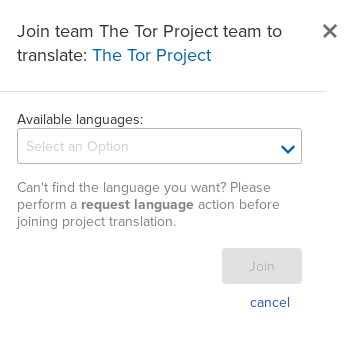 If you are interested in helping out the project by translating the manual or the Tor Browser to your language, your help would be greatly appreciated! Tor Project localization is hosted in the Localization Lab Hub on Transifex, a third-party translation tool. In order to begin contributing you will have to sign up with Transifex. Below is an outline of how to sign up and begin. Before translating, please read through the Tor Project page on the Localization Lab Wiki. There you will find translation guidelines and resources that will help you contribute to Tor translations. On the next page, select 'Join an existing project' and continue. 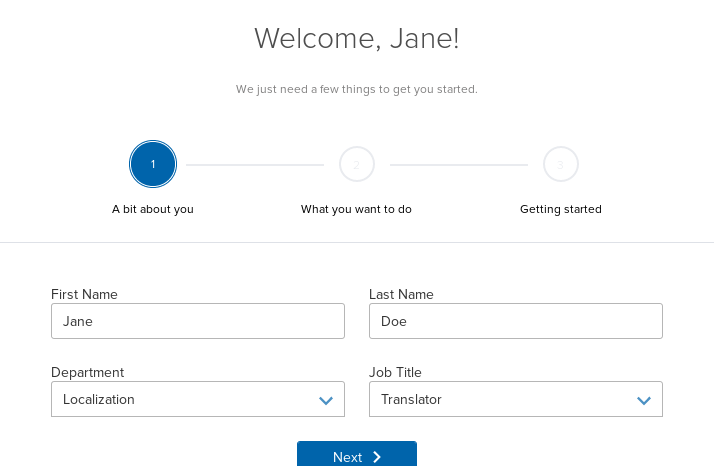 On the next page, select the languages you speak from the drop-down menu and continue. You are now signed up! Go to the Tor Transifex page. After your membership is approved you can begin translating; there is a list of needed translations at Tor Transifex page when you are ready to begin. Thanks for your interest in helping the project!